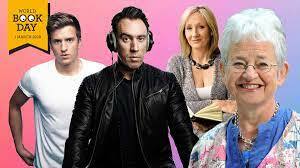 Ali A, Christian O’Connell, Greg James, Chris Smith, Jacqueline Wilson and more on Fun Kids this World Book Day! Check out the full schedule below and how to listen! Thursday, 1st March 2018 is World Book Day and we’ve got loads happening on Fun Kids! Throughout the day, you’ll hear lots of top authors chatting to us about their books, including Jacqueline Wilson, Ali-A, Greg James & Chris Smith and Christian O’Connell. Plus, we’ve got special readings from Richard Graham, Andy Riley, Jo Franklin and Harry Hill! Check out the schedule below to find out more about what’s going to be on-air. At 7am, Sean is chatting to Ali A about Ali A Adventures: Game On. At 8am, Sean’s chatting about the new Radio Boy book to Christian O’Connell, who wrote it. 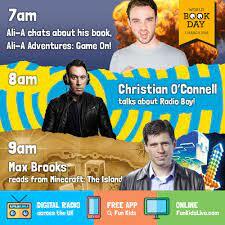 9am sees Max Brooks reading from Minecraft: The Island. At 10am, Richard Graham is reading from The Cranky Caterpillar. 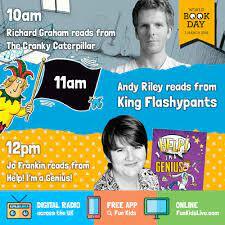 At 11am, Andy Riley is reading from King Flashypants, a book all about a boy who’s also a king! Jo Franklin reads from Help I’m a Genius at 12pm. 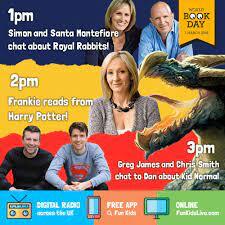 At 1pm, Dan interviews Simon and Santa Montefiore who wrote a book called the Royal Rabbits of London. At 2pm there’s a reading from Harry Potter and the Goblet of Fire. Dan’s interviews Greg James and Chris Smith about Kid Normal at 3pm. 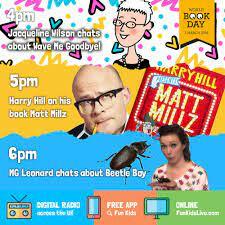 5pm sees Harry Hill read from Matt Millz. And at 6pm Bex interviews MG Leonard about the latest book in the Beetle Boy trilogy. Listen on March 1st from 7am for all things World Book Day!